Sky Murder is a 1940 film starring Walter Pidgeon in his third and final outing for MGM as Nick Carter. Whilst attempting to prove a beautiful immigrant innocent of murder, detective Nick Carter ends up exposing the leaders of the Fifth Column. According to MGM record, the film earned $270,000 in the US and Canada and $167,000 elsewhere, making a profit of $64,000. The New York Times wrote, "let a Hollywood producer launch a film series and very shortly the stories, as they appear, become as formalized as Chinese checkers. The Nick Carter mysteries are no exception...Through it all Nick is magnificently careless. Though sudden death lurks outside the window pane, he never pulls a shade. When seconds count, he saves one to pinch a cutie's cheek. When lesser men quail, he lights a cigarette. As usual, he wins his game in a welter of comic-strip heroics. But, as we were suggesting, it's a little like playing checkers with an opponent whose tricks became familiar long ago". Leonard Maltin called the film an "above-average private-eye yarn." ^ "Sky Murder (1940)". BFI. 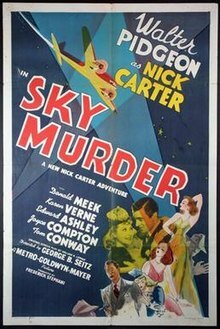 ^ "Sky Murder (1940) - Notes - TCM.com". Turner Classic Movies. ^ "Sky Murder (1940) - Overview - TCM.com". Turner Classic Movies. This page was last edited on 26 October 2017, at 04:40 (UTC).